It is one loooonnngg flight from Chicago to Shanghai — more than 14 hours. And since we essentially fly with the sun, it never gets dark. We step into a time machine at noon on July 28 and step off an hour and 40 minutes later, on July 29. A day gone, with an eternity sitting in a darkened cabin in between. And it was fabulous. The first to arrive was the only thing we didn’t love. Sweet and sour vermicelli was the least vermicelli thing I have ever seen. 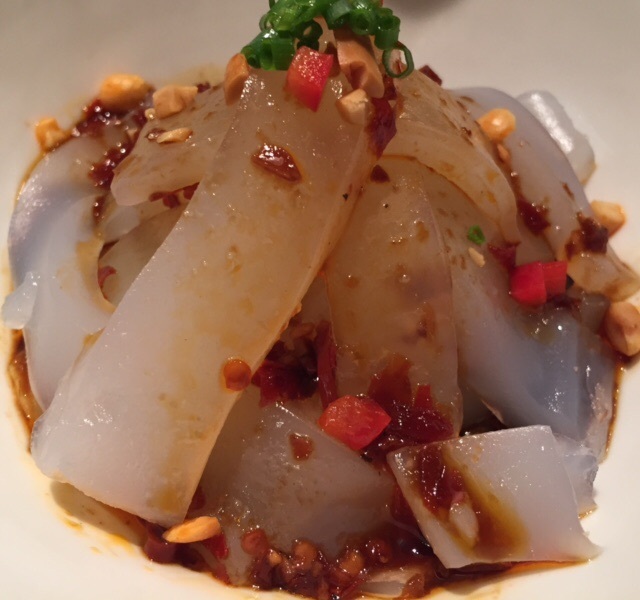 Thick strips of dense chilled rice noodle — too heavy to be penetrated by the otherwise very good chili oil it was bathed in — so that each bite was icy cold, gelatinous, chewy and spicy hot. Not a good combo. BUT — everything else was fab. 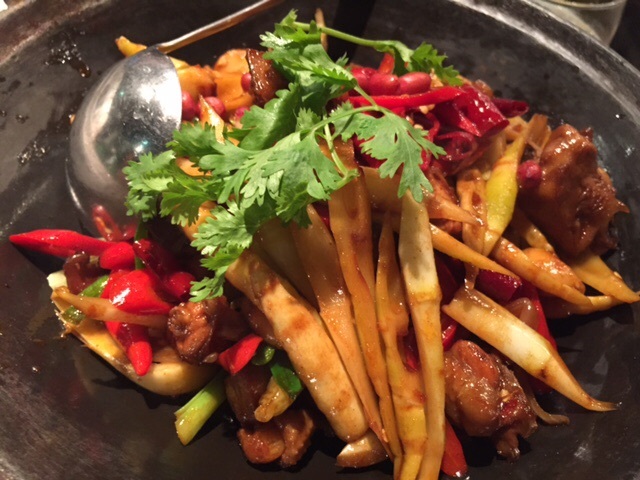 Cold roast eggplant in chili oil, brought to the table in a mortar and crushed to release the chili heat. 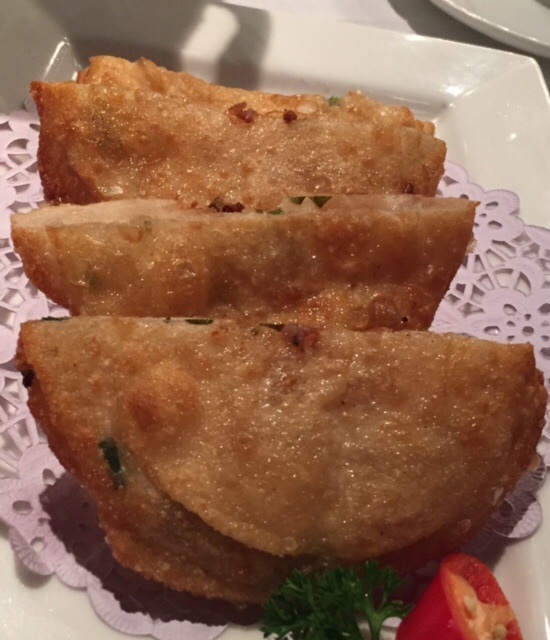 A plate of green onion pies — fantastic light and crispy versions of the doughy scallion pancake we can find at home. 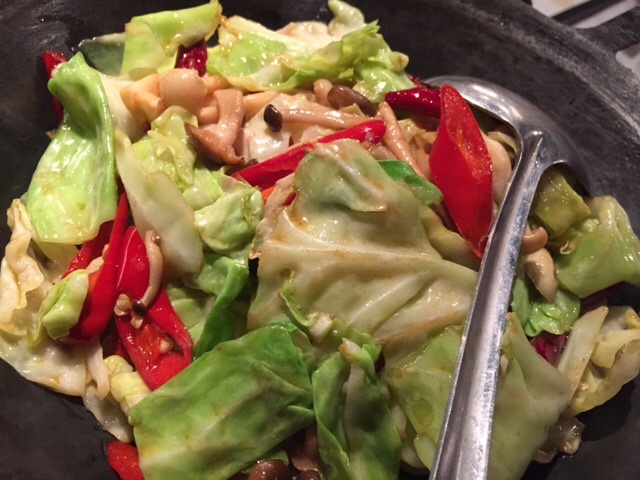 A wok pot of vegetables filled with crunchy cabbage, exotic mushrooms, tofu skins, and hot, hot red chilies. Zowie! 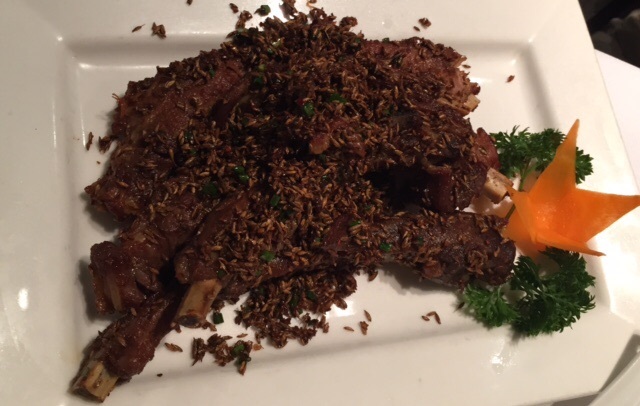 The meat eaters had some cumin crusted pork ribs for which the place is famous. They weren’t pretty but we didn’t have to look at them long — they disappeared in a flash. 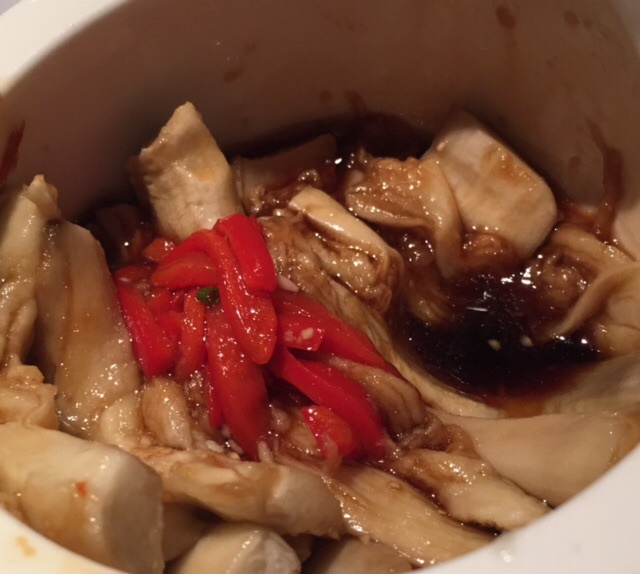 A wok pot of chicken and honest to goodness fresh and crisp bamboo shoots. None of that canned watery crap that shows up at home. 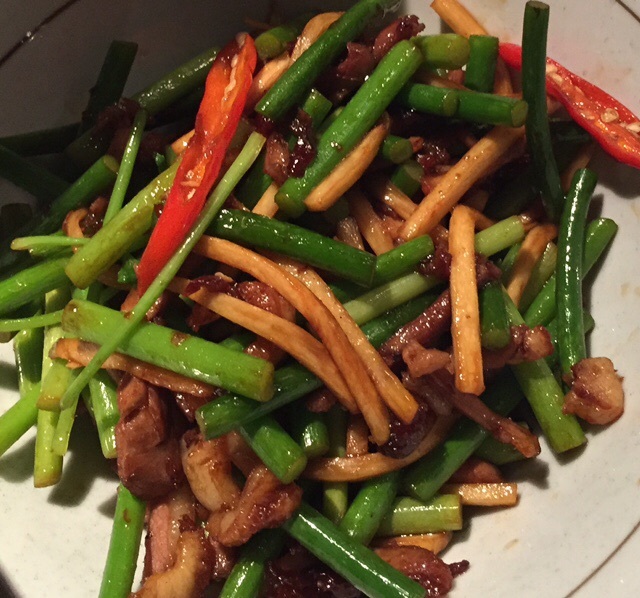 A dish of duck with Chinese long beans and scallion. And a homey rice dish with chopped veg and preserved pork. 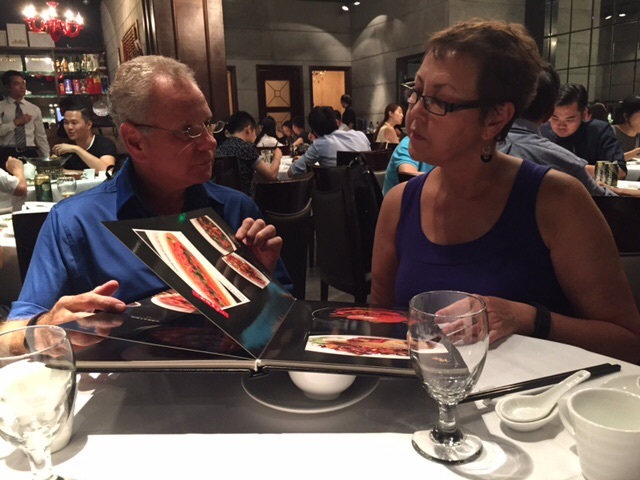 Previous Post So far being 60 is delicious! I left you an email on your indiana.edu account, but I’m not sure if you’re still a faculty member.